February 4, 2011 Movies, UncategorizedFrançois Pienaar, Invictus, Matt Damon, Morgan Freeman, movie review, Nelson Mandela, rugby, South Africa, South Africa under apartheidReba R.
This week my fiance and I decided to watch Invictus. The main reason for our selection was that it was just about to start on HBO [or one of those many HBOs], and we wanted to catch a movie from the beginning. I'm not crazy about the marketing for this film. But by luck I caught it on cable. When Invictus came out in 2009, I really had little interest in seeing it — ever. 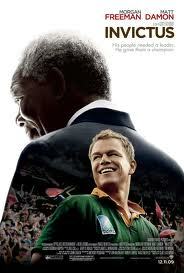 The commercials made me think it was about rugby, and that Morgan Freeman’s Nelson Mandela was a supporting role to Matt Damon’s starring one, as captain Francois Pienaar.